Showing results for tags 'HandlebarsampControls'. These guys are designed for Adventure. Whether you’re ripping a snow bike across the frozen backcountry, riding an old road bed through a deep pine forest, or cruising along a twisty mountain road - Fastway’s Adventure pegs offer a level of comfort and control you’ve never thought possible. 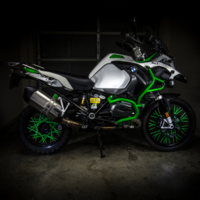 We’ve packed all our foot peg technology inside, and given them the looks to compliment any Adventure bike, or Off-road bike on our fitment list. Every angle has been carefully designed to shed mud and snow, all while making you wonder why you didn’t buy them sooner. Measuring a perfect 2.25" front to back by 4.75" wide; they’re the perfect solution for your next Adventure. 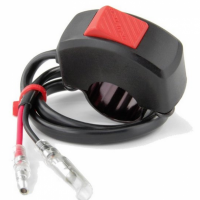 Handlebar mounted on/off switch with bullet terminals. This rocker style toggle switch features internals custom designed by Trail Tech for extremely stable and smooth operation. High current contacts handle more power than other switches (will not melt). 10" Pigtail, 3/4" wide. 38mm taller bar position 2 densities of rubber cushioning included. Handlebars are moved forward 13mm to open up the rider cockpit Added vibration isolation from the motorcycle. Billet aluminum anodized black. 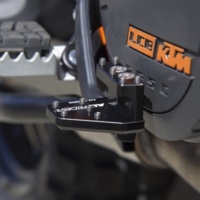 BRP KTM Adventure Vibration Isolaton SUB Mounts are designed exclusively to fit the OEM triple clamps. These pegs come in pairs, fully assembled with the tread you select. All treads are silver anodized. 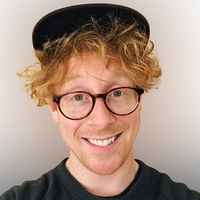 Additional treads are available at the bottom of the page. Ready to buy? Select your parts below. Click on a photo for a larger view. Photos represent tread and finish you will receive. Mounting features (such as hole size) will be correct for your bike, which may not be exactly as shown in photos. 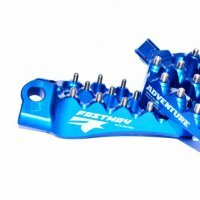 All our foot pegs come in pairs. 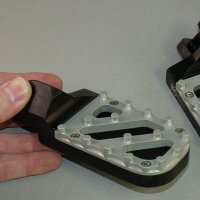 General Information Our motorcycle foot pegs are all have one piece mounts - a strong, simple design. They come in two categories; pegs for street bikes, with a tread 1-1/8 inches across by 3-3/4 inches long (29 mm x 95 mm), and pegs for dual-sport and off road bikes, with a tread 2 inches across by 3-3/8 inches long (51 mm x 86 mm). The wide pegs have the extra tread toward the back of the bike. We make each foot peg from solid 6061-T6 aluminum (heat treated, high strength alloy, sometimes called aircraft grade aluminum). Because these parts are aluminum, they will never rust. We sell all our foot pegs in pairs. 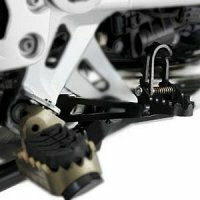 Foot Peg Height and Lowered Foot Pegs We make foot pegs that come straight out of the mount, as well as models that lower your foot up to two inches or more. When you lower your foot position, you will want to check the height of your shift and brake levers for comfort and access, and adjust if needed. Tread We offer two tread options for street bikes, and two for dual-sport and off road models. They're shown at right. Click on the pictures for a larger view. 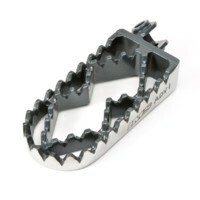 Street Sidetrax is a good street bike tread, with grip most similar to your stock foot pegs. Quadtrax is a high traction tread, with small points on the top that grab onto your boot. Dual Sport and Off Road 2x3 Wide foot pegs have an interchangeable tread. They come with two tread options, both suited to dual sport and off road use: Hunter tread has the same traction points on the top as Quadtrax, but the foot peg is wider front to back, and shorter across your foot, giving a better base for your feet in rough terrain. Trakker tread has pin grips for your foot, and is good for use in the dirt and mud; the pins stick up further than with the other treads, reaching through dirt to give you a good grip. Safety All our foot pegs swing back like your stock pegs - important in case your peg gets close to the ground or another object. 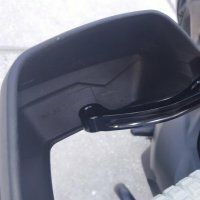 Ground Clearance For most bikes, the bottom tip of 1 inch lowered foot pegs sits at approximately the height and location of the tip of your stock curb feeler (the finger sticking out the bottom tip of your stock pegs). In this case, there is no loss of ground clearance with our lowered pegs. This varies widely from bike to bike; please ride with caution until you get used to your new foot pegs. 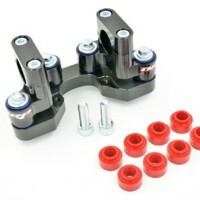 Mounting Most of our pegs mount with your stock foot peg pivot pin, spring, and retaining clip. Exceptions are listed for specific models. Installation is quick and easy: remove your stock pivot pin retaining clip, pivot pin, and spring, noting orientation of the spring. Remove your stock foot peg and replace with our foot peg. Reinstall your spring, pivot pin, and retaining clip. > The Rox Pro-Offset block Risers raise your bars straight up 1 1/4" (vertical) or up 1" and back 1" when installed the other direction. Pro-Offset Elite riser comes with the addition of 7/8" bar reducers. This allows you to clamp 7/8" bars or remove them to clamp 1 1/8" "fatbars", making use of your stock bars now at a more comfortable height and upgrading to "fatbars" later. Reducers lock into risers to insure no slippage between components, as well they have serrated teeth in them for maximum gripping power on handlebar. 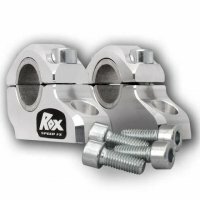 > Rox Pro-Offset risers have an oblong hole so that they will fit virtually any fore and aft bolt center to center distance with 8mm bolt threads. > First determine if you have adequate cable length before installing handlebar risers. 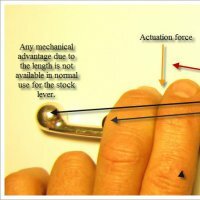 Check throttle routing and length. You may have to adjust position of controls, or purchase extended cables for proper operation. 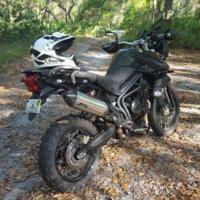 These new stainless steel, hydraulic Super Tenere long lines are specifically made for the Yamaha Super Tenere 1200. There is also a lower clutch line available for a complete install. 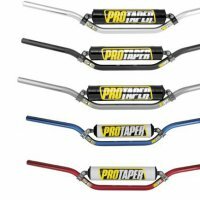 At 2.5″ longer than stock, you can now safely install bar risers to your height preference and have complete piece of mind The brake line kits are manufactured from the highest quality, stainless steel, swaged fittings. The fittings are permanently attached to a stainless steel braided Teflon hose. 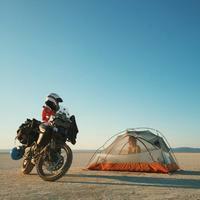 The Super Tenere long lines offer safety, security, and a professional slimline finish. All hoses meet FMVSS-106 standard. The kit contains all items required for a complete installation including stainless steel banjo bolts and copper washers. Innovative clutch levers engineered to reduce both finger fatigue and arm pump thus increasing endurance during high intensity conditions. The Clever’s compact length allows for either a one or two finger operation. 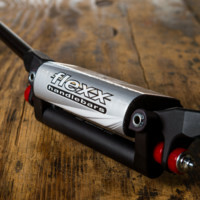 With its easy set up and minimal installation time these levers provide a distinct advantage to any type of rider or racer over all other stock and after market levers. This brake lever is wider than the standard lever and is height adjustable. Features: > Patented height-adjustment mechanism. > Hinged, double-size footplate. > Makes for easier control while standing on the pegs. > Adjusting the height is a no-tools operation - just kick the footplate down before riding off. 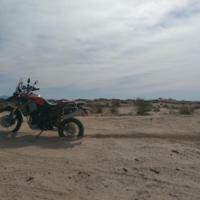 > Installation should be performed only by authorized BMW Motorrad dealers. > Balck anodized finish. > Made of fine-grained sheet steel. 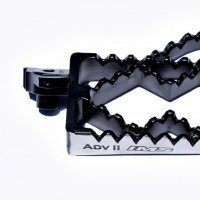 Designed specifically for Adventure riders by Adventure riders, the ADV1 and ADV2 series pegs vastly improving comfort and handling. The large overall length and width enhances comfort and the benefits are felt navigating dirt roads and on long stretches of open roads. The platform spreads the boot contact patch and lessens stress on the feet, legs and hips. Using body English to change directions of a 500lb+ bike is vastly improved as the pegs add leverage. Leaning the bike over and pivoting from one turn to the next is more efficient while providing better control when riding off-road. Superior Comfort, Enhanced Leverage, Lifetime Warranty and built in the USA by off-road market leaders since 1976. -Cast Certified 17-4 Stainless Steel -Powder Coated and Polished Finish -Certified Heat Treating (Homogenizing and Annealing process) -Superior Patented Mud Relief Tooth Design -Increased Width provides Additional Comfort and Handling -LIFETIME WARRANTY -Built in the U.S.A. IMS Products proudly introduces new Footpegs designed specifically for Adventure riders, the ADV1 and ADV2 series pegs. 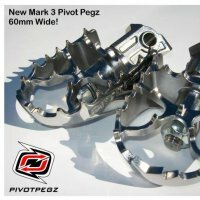 Tested by club adventure riders and IMS owner, Scott Wright, the ADV Pegs are a watershed design vastly improving comfort and handling. The large overall length and width enhances comfort and the benefits are felt navigating dirt roads and on long stretches of open roads. The platform spreads the boot contact patch and lessens stress on the feet, legs and hips. 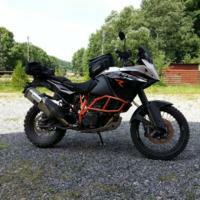 Additionally, as an avid Adventure rider, and former Baja 1000 winner, owner Scott Wright raves about the overall handling improvements. Using body English to change directions of a 900lb+ bike is vastly improved as the pegs add leverage. 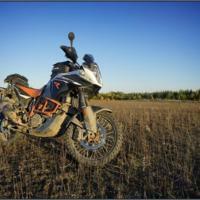 Leaning the bike over and pivoting from one turn to the next is more efficient while providing better control when riding off-road. Superior Comfort, Enhanced Leverage, Lifetime Warranty and built in the USA by off-road market leaders since 1976. 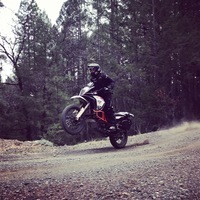 Owner, and enthusiast, Scott Wright stands behind and atop the new Adventure Footpegs. Adventures riders will as well.